OLIVES are very much an acquired taste, one that, thankfully, I learned to enjoy quite a few years ago. We grow terrific olives here in Australia. Our country has so many different climates in so many areas that there are few crops we cannot manage here once good farming practices are applied. 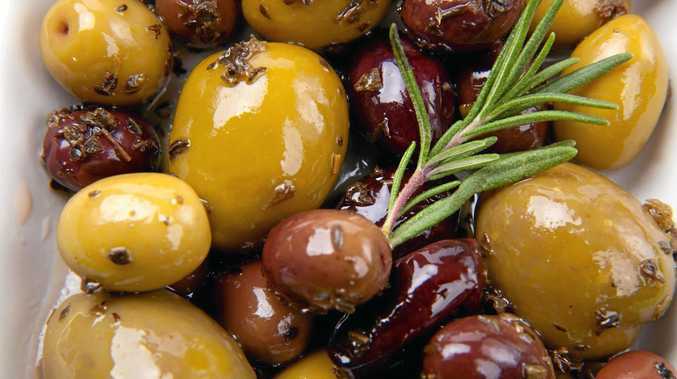 I often wonder how we first discovered olives were edible; the raw fruit is not thanks to a bitter compound called oleuropein. Depending on the age and variety of the fruit it can be leached out by splitting the olives and soaking them in water - changed daily - for a length of time (up to a month). Other varieties need to be cured by one of several methods using salt, brine or lye. So it's quite a process to convert them to the tasty nibble we enjoy with drinks, on pizzas or as an addition to many Mediterranean recipes. I like to buy a good brand of Aussie olive and then marinate them myself. They are delicious served warmed with pre-dinner drinks. Just about any of your favourite herbs and spices can be used. My personal choices are thyme, rosemary, garlic, nigella (black cumin) seeds and a little dried chilli. Feel free to experiment: oregano, sage, marjoram, regular cumin seeds, mustard seeds, mandarin peel, and peppercorns are alternatives. METHOD: Drain brine from olives and discard. In a small saucepan, combine oil, lemon zest, garlic and herbs, reserving one sprig of rosemary for garnish. Add fennel or nigella seeds and chilli flakes if using. Heat oil over a medium heat until garlic just starts to colour; don't allow it to brown as it will become bitter. Remove from heat and stir in the olives. Cover and allow to sit for at least 15 minutes, preferably overnight.